Wearing jeans and a t-shirt is definitely my comfort zone. I often feel basic when I wear that combo but I’ve learned if you add in today’s trends you’ll be anything but basic. Once you add layers and accessories you’re look will become even more fashion forward. Let’s start with the t-shirt. Choose a shirt that has a graphic or a message you like. If you want a solid shirt than choose one that has slits around the neckline or can knot at the waist. 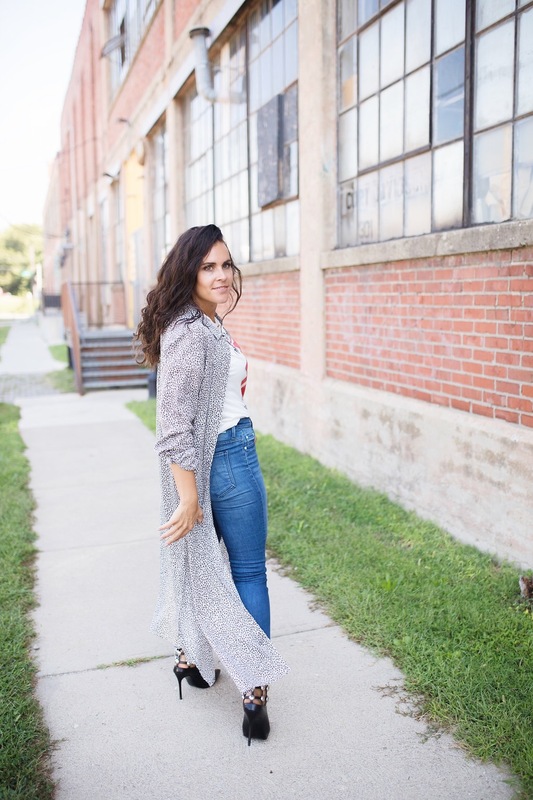 You can wear you classic bootcut or skinny jeans but if you are trying to look fashion forward you need to wear a pair of cropped flares, wide leg, or racer stripes in a high waisted style. Now it’s time to layer and accessorize. Anything goes with this look, you can wear statement earrings, dainty necklaces, stacks of bangles. 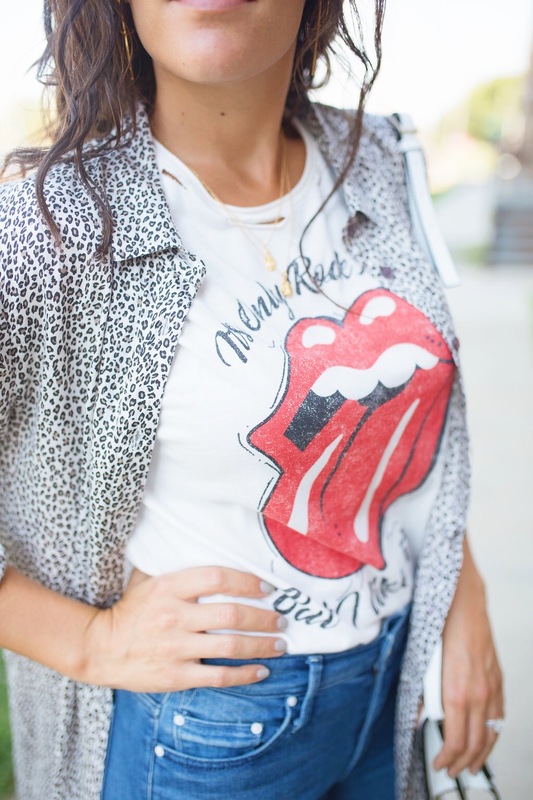 Prints on prints can be fun too so if you are thinking of adding a jacket choose animal print or camo! I have a hard time wearing denim that’s not high waisted. They are so much more comfortable and when you sit down you don’t have to worry about your undies sticking out! 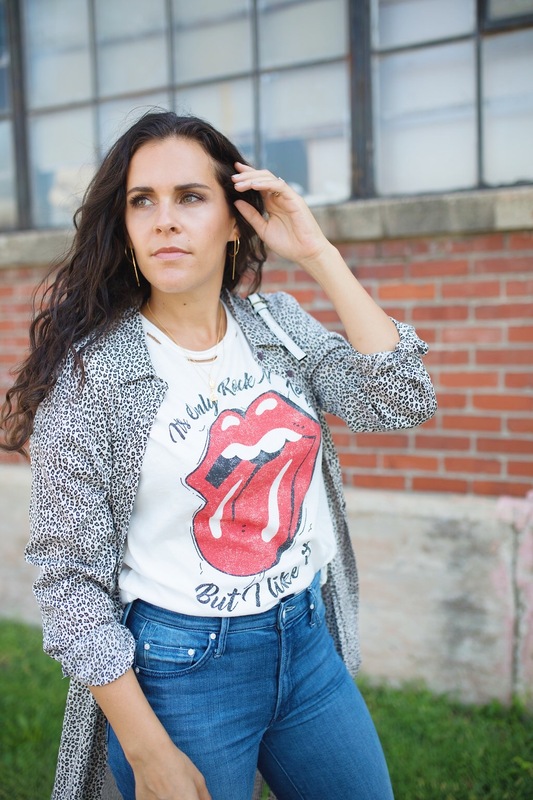 These Mother cropped jeans are my go to, I have them in multiple washes too. They are soft, have the perfect amount of stretch, flare ever so slightly. I wasn’t sure if I was going to like these pointed toe booties with the jeans but I think it turned out just fine 🙂 My graphic tee and leopard shirt (worn as a jacket) are from a new store in Columbus that I recently checked out and I love the combo together. My white bag has come along way. I wear it way more than I ever thought I would. It was a spring staple that carried me through summer and now fall!